While the American South had grown to expect a yellow fever breakout almost annually, the 1878 epidemic was without question the worst ever. 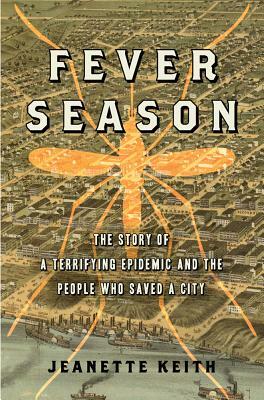 Moving up the Mississippi River in the late summer, in the span of just a few months the fever killed more than eighteen thousand people. The city of Memphis, Tennessee, was particularly hard hit: Of the approximately twenty thousand who didn't flee the city, seventeen thousand contracted the fever, and more than five thousand died-the equivalent of a million New Yorkers dying in an epidemic today. Fever Season chronicles the drama in Memphis from the outbreak in August until the disease ran its course in late October. The story that Jeanette Keith uncovered is a profound-and never more relevant-account of how a catastrophe inspired reactions both heroic and cowardly. Some ministers, politicians, and police fled their constituents, while prostitutes and the poor risked their lives to nurse the sick. Using the vivid, anguished accounts and diaries of those who chose to stay and those who were left behind, Fever Season depicts the events of that summer and fall. In its pages we meet people of great courage and compassion, many of whom died for having those virtues. We also learn how a disaster can shape the future of a city. Originally trained as a journalist, Jeanette Keith obtained her Ph.D. in history from Vanderbilt University in 1990 and is currently professor of history at Bloomsburg University in Bloomsburg, Pennsylvania. She is the author of several books, including Country People in the New South and the award-winning Rich Man's War, Poor Man's Fight.